Black Cat Jook Band are playing an all-acoustic gig in the intimate atmosphere of “Off the Rails” on Saturday 27th February at 7.30 p.m. The band plays “vintage Americana”: Jug band music, country blues, ragtime, skiffle and Vaudeville, on guitars, ukulele, mandolin, harmonica, tuba, washboards and tea-chest bass. The band has a long history on the Scottish Blues scene, and for many years played as the Elevators, a six- piece Chicago electric blues band. They’ve mellowed now and bring their unique sound to bear on the music of Big Bill Broonzy, Memphis Minnie, Tampa Red and other bluesmen and women of the 30’s and 40’s. 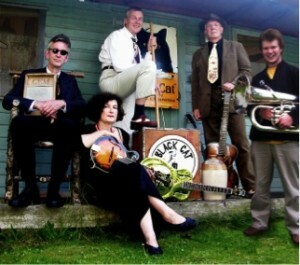 Come and have an evening of the fun side of the Blues with Black Cat Jook Band. Space will be tight, so book in advance. Tickets £7.50 from Doug or Jan at 01337 830956.